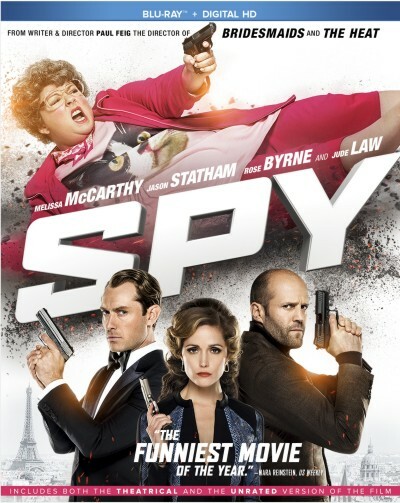 I'm a big fan of Melissa McCarthy so I was pretty excited to receive Spy and check it out with my family. And as I had already figured it was a laugh out loud movie. She definitely didn't disappoint when it came to her usual funny antics. I won't give anything away but I will tell you this is one of those movies you want to stop and actually watch and listen to and not do anything else at the same time. If you do you'll be disappointed because you will miss so funny stuff. Queen of Comedy Melissa McCarthy “in her funniest movie yet” (Leonard Maltin, LeonardMaltin.com) embarks on the mission of a lifetime as secret agent Susan Cooper in SPY. The global ensemble cast features Jason Statham, Jude Law and Rose Byrne who deliver hysterical performances in this summer blockbuster hit that totaled over $100 million in the domestic box office. The movie was adored by critics who gave it an astounding 95% fresh rating on RottenTomatoes.com. McCarthy is armed and hilarious in this “outrageously entertaining” (Peter Travers, Rolling Stone) comedy hit from director Paul Feig (The Heat, Bridesmaids). Deskbound CIA analyst Susan Cooper (McCarthy) is about to become the world’s newest — and unlikeliest — secret weapon. When her partner (Law) falls off the grid and another top agent (Statham) is compromised, Susan volunteers to go deep undercover and bring down a deadly arms dealer. Loaded with wise-cracking action and adventure, SPY is a mission impossible to resist! Giveaway CLOSED - The winner has been notified via email and confirmed. Win it: One lucky reader will win a Spy DVD/Blu-ray. This giveaway will end October 14th at 11:59 PM EST. The winner will have 48 hours to respond to my email. If no response, a new winner will be chosen. Prize fulfillment will be made by the sponsor, I am not responsible for prize delivery or lost or stolen deliveries. Open to residents of the US. I'd like to watch this with my son and his wife. I'll for sure watch it with my husband. Our daughter is 9 so I doubt that she'd be into it. I would love to watch this with my husband! I would like to watch this with my sister. I'd watch this with my mom. We both love Melissa. I would like to watch it with my wife. I would watch it with my husband. I would watch it with my best friend Andrea! I would watch it with my family. I would love to watch this with my family as it sounds hilarious. I would love to watch this with my husband. I would watch this with my husband. I would watch it with my boyfriend. My daughter & granddaughter would watch this DVD with me. They like Melissa MCarthy. We love comedies. I would watch this with my two daughters. This looks like a good comedy movie. I'd like to watch this with my family. When Spy first came out, I went to see it with my mom. Girls Day Out! I would love to watch this with my husband! It looks so funny! I want to watch this movie with my daughter. I would watch this movie with my husband. I would watch this with my sister! I would watch with my mom. I commented on the non-giveaway post: Learn about Animals with crafts from Oriental Trading for an entry.